Aresa Biodetection, a Danish Company, has genetically modified the plant species arabidopsis thaliana (Thale or mouse cress) so that it turns red in the presence of old landmines. 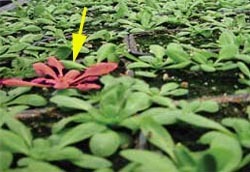 The technology takes advantage of genes that cause plants to turn red in autumn. The modification causes plants to respond to different stimulous, in this case, the nitrogen dioxide or heavy metals that are released into soil as landmines decay. Old landmines kill nearly 26,000 people in third world countries every year, where vast areas of farmland cannot be safely worked because of uncleared ordinance (90% of Angola and 40% of Cambodia, for example). The technology has excited a lot of interest, but is not without skeptics. To counter fears that the genetically-modified plants might spread naturally into the environment, Aresa claims that male-sterility can be introduced into plants, to control growth. The company reports that the technology is now in the last stage of the patent process, and work on the plant itself is being fine tuned. They hope to start field testing in the Balkans in the spring of 2005.
it is a pleasure to look at your colourful web-pages with all the information and personal impressions.